Need a rich and gorgeous-looking cake to serve with coffee or finish your next dinner party? I wholeheartedly recommend this chocolate-blueberry-sour cream cheesecake. There's a Digestive and dark chocolate base (graham crackers would work just as well), topped with blueberry and cream cheese layer. These two layers are baked in the oven. When the cheesecake is cooled, it's topped with a third layer, a sour cream jelly layer, which provides a stunning contrast in colour as well as a cooling flavour and texture contrast. Our family and friends were very pleased with the cake. 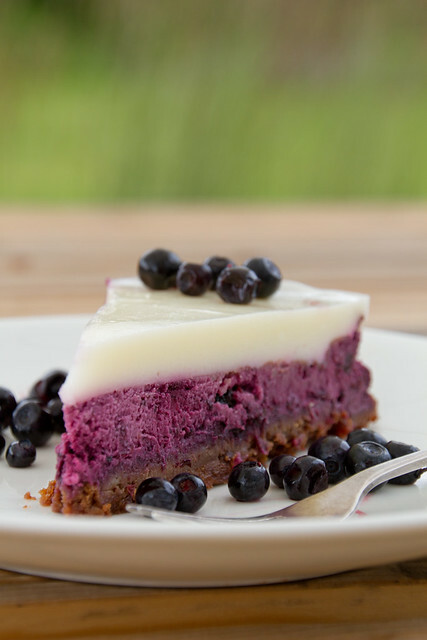 You can use both blueberries (Vaccinium corymbosum) or bilberries (Vaccinium myrtillus) for making this cake. The first are more common in the US, are larger and whitish inside, the latter are more common in Europe (Scottish blaeberries, French myrtilles, Estonian mustikad), are smaller and blackish-blue inside (see here for a very good comparison of the two). I used the latter - simply because it's the bilberry season just now, and it's a very good year for local bilberries (reflected also in the prices at the market. Note that the anthocyanin content of fresh bilberries is almost 4 times higher than in blueberries, so if you can choose between the two, go for the smaller wild berries. The cheesecake keeps for a few days in the fridge. Cover the base of a 24 cm/10'' springform tin with parchment paper. Make the cookie base: Place Digestives and chopped dark chocolate into your food processor and process till fine crumbs form. Add the melted butter and process again till combined and moist. Press the cookie mixture onto the base of your prepared tin. Bake for about 10 minutes in the pre-heated oven. Meanwhile, make the cheesecake layer. Use a kitchen tissue to wipe the bowl of your food processor clean. Place all the ingredients into the bowl and process till smooth and dark purple in colour. Spoon the cheesecake mixture onto the pre-baked cookie base, smoothing the top. Return to the oven and bake for about 40 minutes, until it looks set (it'll set further when cooling). Remove from the oven, let cool to the room temperature, then cover with kitchen foil or clingfilm and place into a fridge or a cold larder overnight (or for at least 4 hours). Couple of hours before serving, cover the the cheesecake with the sour cream jelly layer. Soak the gelatine leaves in cold water for about 5 minutes. Mix sour cream and sugar in a small saucepann and heat slowly on a low heat, stirring regularly, until the sugar has melted. The mixture should be about 60-70 C (140-158 F). Now squeeze the gelatine leaves dry, one at a time, and stir into the sour cream mixture until amalgamated. To serve, carefully transfer the cheesecake onto your serving tray. Decorate with more berries and serve, cutting into slices of your preferred size. For readers in Canada and the US, where sheet gelatin isnt available, one tablespoon of powdered gelatin supposedly equals 4 gelatin sheets. So if youre using the generally available Knox powdered gelatin, go for 3/4 of a tablespoon. This is so beautiful! I love cheesecake! 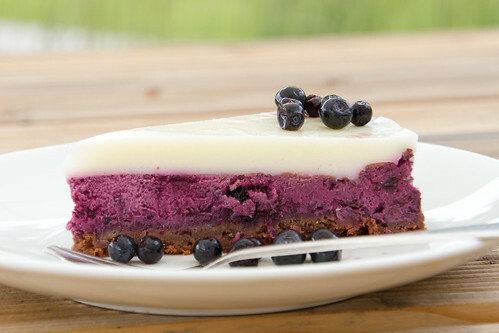 your blueberry cheesecake looks amazing! What a lovely blueberry cake! I still have about half a kilo blueberries after a trip to the forest yesterday,so maybe I will make this.Like very much the new look of your blog! PS I was also tempted to use peaches instead of blueberries, think this is a most adaptable recipe, my favorite kind! mmm i love the colour of this cheesecake! divine. Cheesecake is my favourite. Well done. Spread the news. Keep the good work. You might as well check the following link for more details on food. The Blueberry Cheesecake recipe look so fresh on the pancake.